If you subscribe to The Dodo then chances are you are aware of the issues facing America's wild horses and burros and you've most likely read the endless news stories of wild horse round-ups in the West, where thousands of wild horses are removed from the public lands, placed in government holding pens, and imprisoned for crimes they did not commit. The stories are heartbreaking and the cost to tax payers to house and feed over 46,000 wild horses and burros in government holding facilities tops 80 million dollars a year. There are many wild horse advocacy groups who are working tirelessly to stop these horrific round-ups but the question remains what do we do with the large numbers of wild horses and burros living out their lives in holding facilities. Today, it is estimated that there are as many wild equines in these government than there are running free. The West is drying up and the competition for the resources available on public lands is being up divided between big business and the livestock industry, leaving very little for natural habitat that supports all wildlife. In 1988, one cowboy with a dream and a mission to save wild horses decided to act. Dayton O. Hyde convinced the Bureau of Land Management to hand over thousands of captured horses so he could give them back their freedom on a large piece of land in South Dakota. It wasn't easy and the ranchers near the sanctuary he was creating were not supportive of his idea. But Hyde persisted and now, 27 years later, the Black Hills Wild Horse Sanctuary continues to protect the freedom of thousands of wild mustangs offering them more than 13,000 acres of some of the most sacred and spectacular Western landscapes to gallop over. 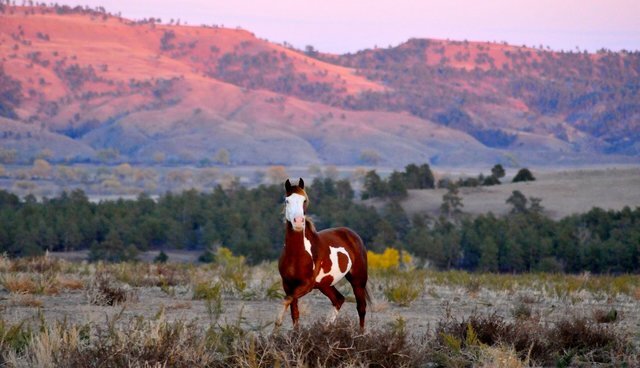 The photo for this article was taken at this unrivaled range land and displays one of the many wild horses who once again live their lives in freedom. To really understand what Dayton Hyde and his many supporters and volunteers accomplished, I set out on a twelve year journey to film what has become a feature length documentary "Running Wild: The Life of Dayton O. Hyde", a film that not only captures the spirit of these wild equines but the soul of a cowboy who has truly made a difference to lives of many wild creatures. My hope for the future is that each of us can take a bit of what Dayton Hyde teaches us and incorporate it in our own communities. It may not be a 13,000 acre wild horse sanctuary but together we can all make a difference if we try.